We have set 5stargroup.es up with one goal in mind which is to offer a 5 star service that goes beyond our customers expectations. 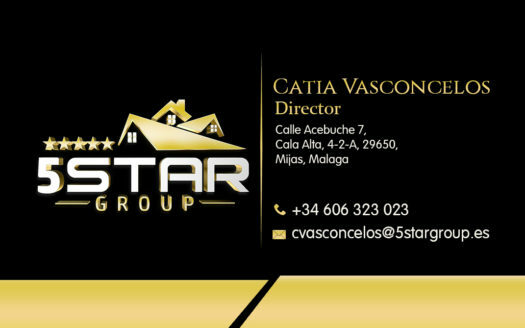 Having spent a combined 25 years working with the real estate market on the Costa Del Sol we always found that our ethos, hard work and total care for our clients did not reflect the attitude of a vast number of companies on the Costa Del Sol which is why we have taken the step to establish this company so that we can truly continue to service our clients without limitations. We spent numerous years operating as commercial agents for a number of banks on the Coast and also on behalf of some of the largest promotors so we have a vast knowledge base of all property sectors that we take great joy in sharing with you. We are also striving to be one of the first reliable real estate companies to provide sellers a true and honest marketing strategy when it comes to the sale of your home. Like most agencies on the Coast we offer access to the multi listing system with over 800 registered agencies which will give your property exposure to the network but we do not stop there. Our web site has been designed to provide a vast exposure to people searching online and we have also integrated floor plans which is a common request and common all over Europe and will give potential buyers a true understanding of there potential purchase. We also have teamed up with YELP as well as google maps to give clients a clear understanding of what facilities are in the area and also a walkscore to nearby facilities. Are marketing does not stop there as we work with various property portals and magazines as well as local advertisements through taxis at the airports and local businesses. Our drive comes from our clients and there happiness with the services we offer through honesty, common sense and hard work. We hope we can get the chance to help you either in your potential purchase or property sale.